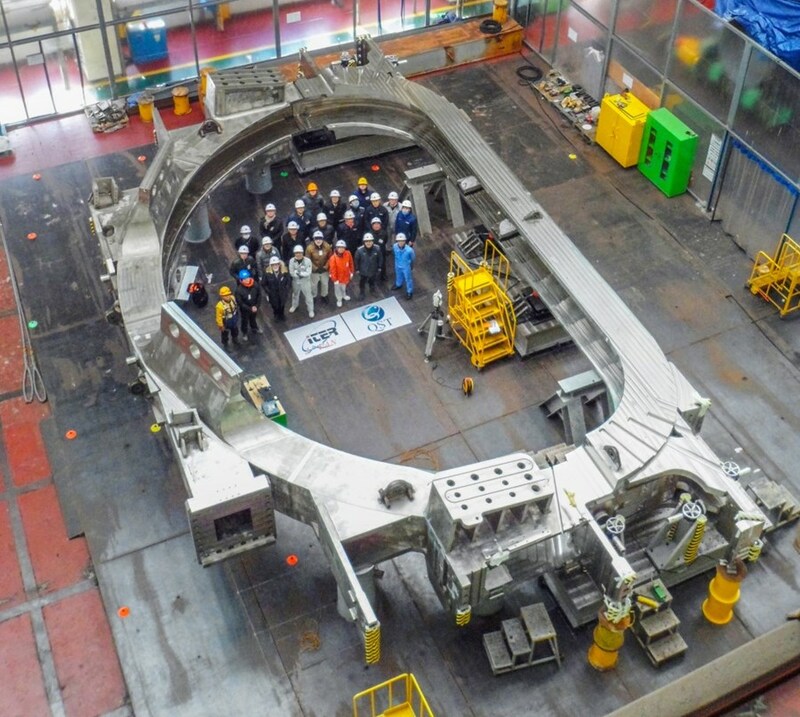 In major news for the ITER superconducting magnet program, the first toroidal field coil case has passed all fitting tests. The two sides of the huge component—as tall as a four-storey building and machined from 20-centimetre-thick steel—were matched within gap tolerances of 0.25 mm to 0.75 mm, an accuracy of more than one order of magnitude in relation to conventional high-precision welded structures of comparable size. Toroidal field cases are D-shaped components, with the inboard leg (right) corresponding to the straight-backed portion of the letter and the outboard leg (left) corresponding to the rounded portion. 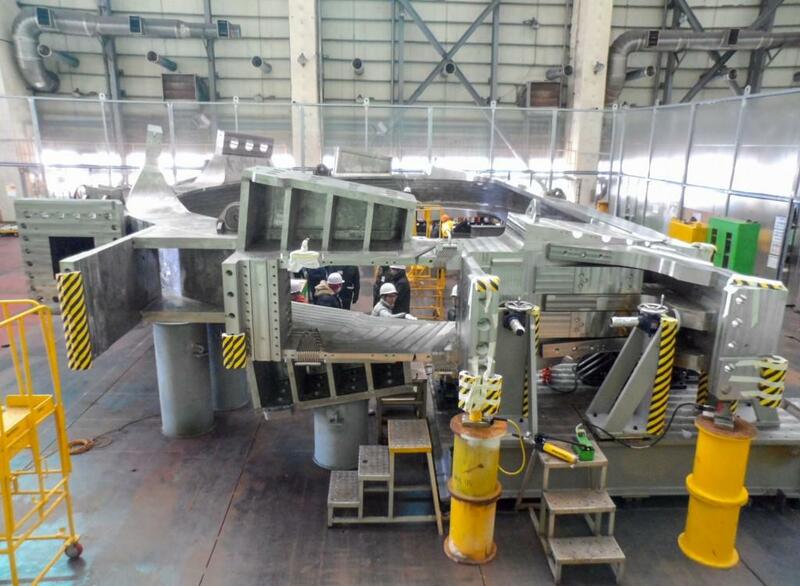 The two legs were successfully matched in fitting tests at Hyundai Heavy Industries in December. On 18 and 19 December 2017, precision laser trackers were used to measure the alignment of inboard and outboard legs of the first toroidal field coil case as well as the precise position and orientation of the heavy steel segments. 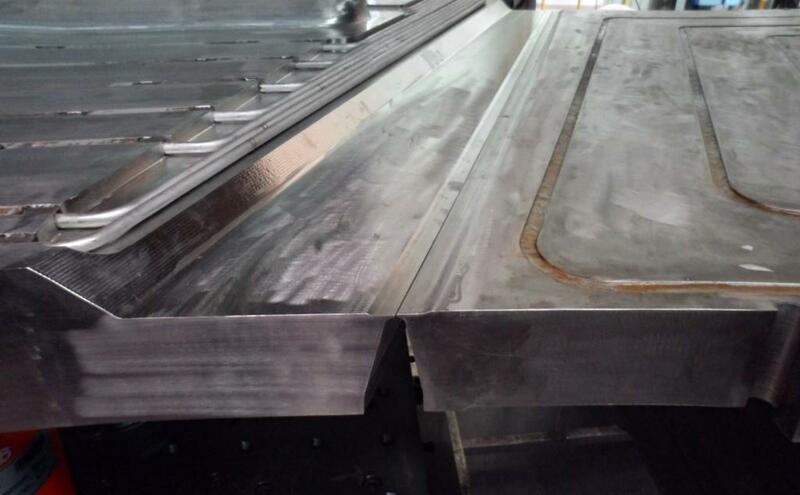 The measurement results were sent electronically to the ITER Organization for detailed analysis, where it was confirmed that giant steel structures matched at all welding grooves with gaps ranging from 0.25 mm to 0.75 mm, fully respecting specified tolerances. "This is a technological achievement of the highest order," declared Eisuke Tada, ITER Deputy Director-General, as he attended a ceremony on 26 December at the testing site. "A component that is 16 metres in height, weighing 190 tonnes, has been successfully pre-assembled to within sub-millimetre tolerances by multiple manufacturers. The international nature of this achievement makes it all the more remarkable." The toroidal field coils cases provide protective covers for the toroidal field winding packs, the superconducting core of the magnets wound from approximately 5.5 kilometres of niobium-tin conductor. The thick steel cases also have a structural role to play, anchoring the poloidal field coils, the central solenoid and the correction coils and withstanding huge electromagnetic loads inside the machine. Japan* is responsible for producing 19 toroidal field coil structures (for ITER's 18 toroidal field coils plus one spare). Nine of the structures will encase the toroidal field coil winding packs produced in Japan, while ten—including this first unit—will be shipped to Italy for the insertion of winding packs produced in Europe. The inboard leg of the first coil case was manufactured at Mitsubishi Heavy Industries, Ltd. (Kobe, Japan). 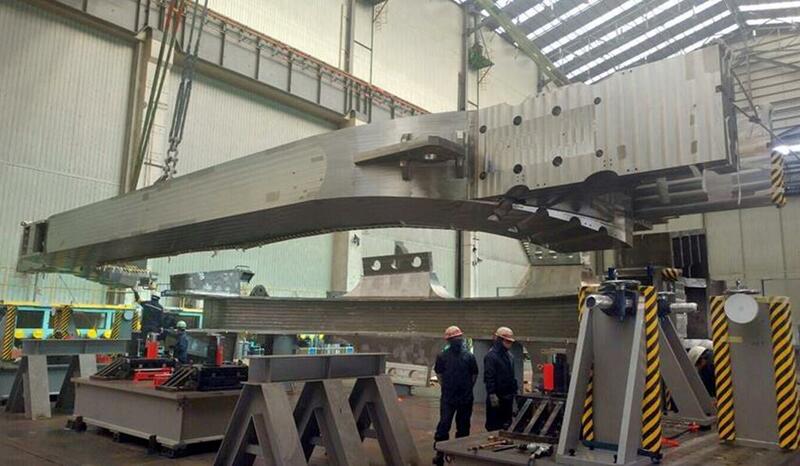 During fitting tests in July 2017 the two sections of the inboard leg—the U-shaped sub-assembly ("AU") that will contain the superconducting core plus a cover plate ("AP")—were successfully paired with gap tolerances of 0.25 mm to 0.75 along the entire 14-metre-long weld groove. At Hyundai Heavy Industries in Ulsan, Korea, the outboard leg sub-assemblies were first fitted together to verify manufacturing precision. Then the principal segments of the coil case, manufactured in both Korea and Japan were positioned and measured. 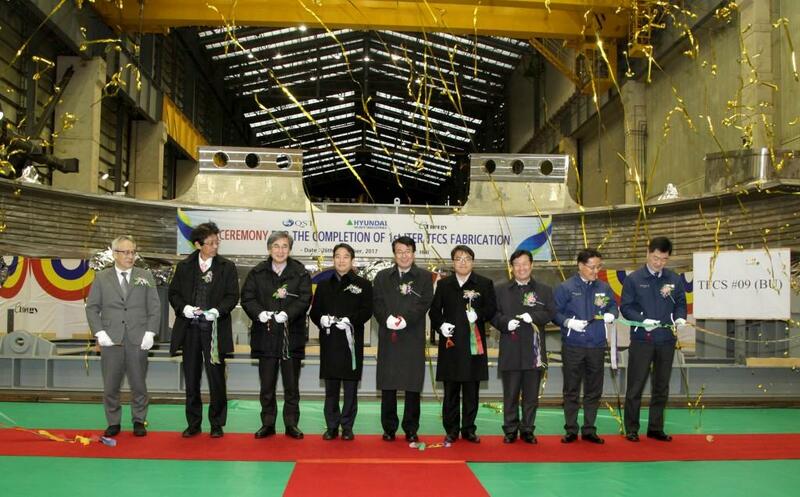 The outboard leg was contracted by Japan to Hyundai Heavy Industries in Ulsan, Korea. The ultimate test was then to verify that structures manufactured in two locations following stringent ITER Organization specifications would fit together perfectly. 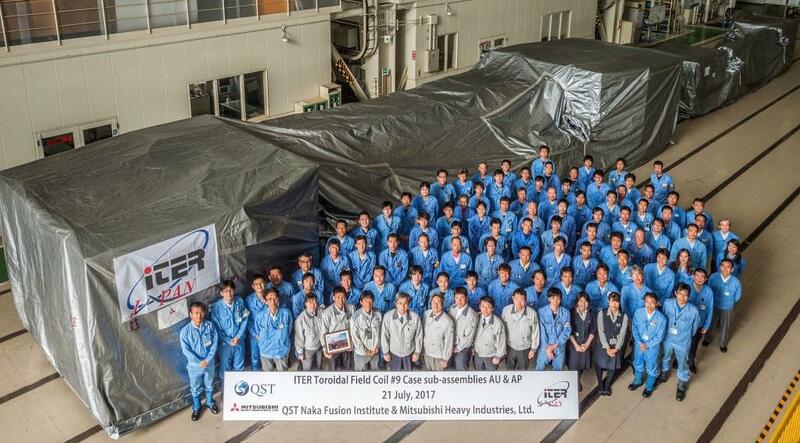 "Ultimately, the story of the toroidal field coil cases is the occasion to showcase the spirit that underlies the ITER Project in its entirety—the "One-ITER" spirit of teamwork that unites us around one design, one schedule and one mission," stressed Deputy Director-General Tada. The required tolerances of bevels at the welding grooves were respected across the board at less than 1 millimetre—with gap variations ranging from 0.25 mm to 0.75 mm. 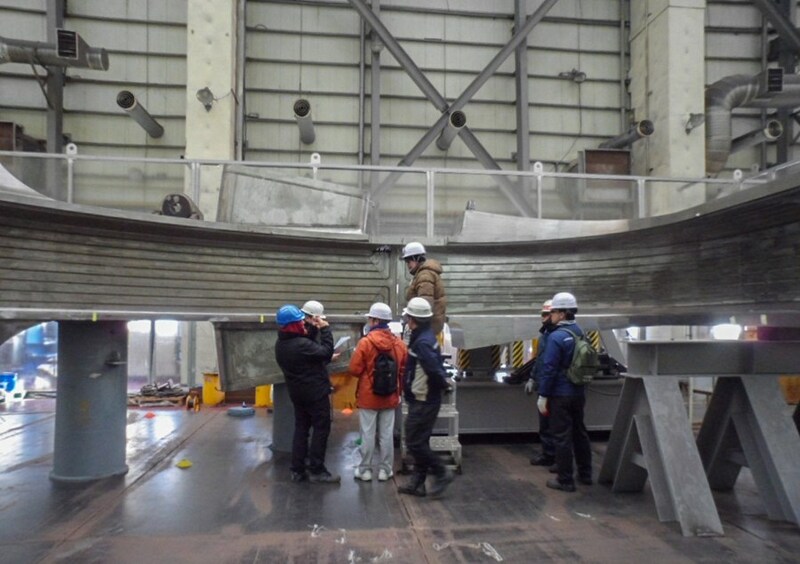 Witnesses on hand during the fitting tests included representatives of the ITER Organization, the Japanese and Korean Domestic Agencies, the European Domestic Agency (which will be receiving the component), and manufacturers Mitsubishi Heavy Industries and Hyundai Heavy Industries. The successful fitting trials of the first toroidal field coil case demonstrates that the final assembly—the insertion of the superconducting winding pack followed by closure welding—can be achieved within the tight tolerances required. This is excellent news, as work proceeds on the fabrication and precision machining of elements for the other 18 cases. The first case is now on its way to SIMIC (Italy), where the first European winding pack has been delivered for insertion. 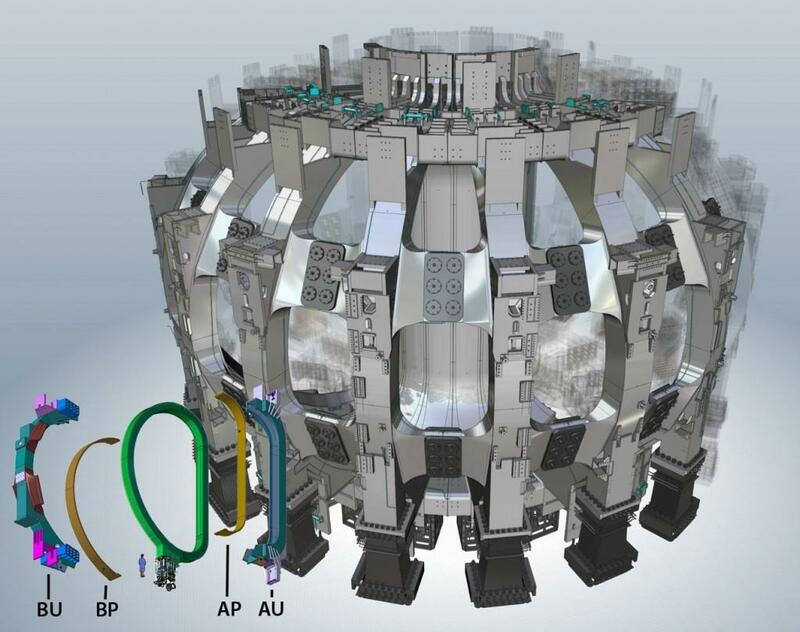 *QST—Japan's National Institutes for Quantum and Radiological Science and Technology—is responsible for the procurement of all components allocated to Japan by the ITER Organization. During the ceremony on 26 December 2017 for the completion of first toroidal field coil structure, which will now be shipped to Italy: (from left) Y. Misawa, President, E-Energy Co. Ltd.; M. Inoue, Director of the Fusion Promotion Office, Mitsubishi Heavy Industries; Y. Kusama, Head of the Japanese Domestic Agency; S. Matsuura, Ministry of Education, Culture, Sports, Science and Technology (MEXT, Japan); E. Tada, ITER Relations Coordinating Officer and Deputy Director-General; CW Lim, Ministry of Science and ICT (MSIP, Korea); KJ Jung, Head of the Korean Domestic Agency; CH Park, Senior Vice President, Hyundai Heavy Industries; and WH Joo, Executive Vice President, Hyundai Heavy Industries. Seen from the bottom of the case structure, the "BU" (left) and "AU" (right) segments are even more complex and their precise matching even more remarkable. Look closely in the middle of the photo to see the V-shaped welding grooves, or bevels. An average grain of sand has a diameter of 1 millimetre. Achieving tolerances of less than 1 millimetre for such large and heavy structures—manufactured in two separate factories—is a major accomplishment. 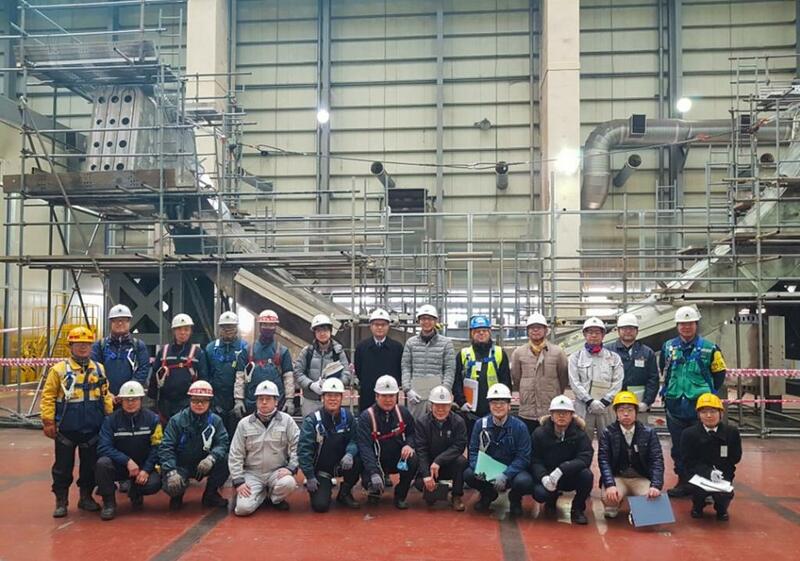 Following successful fitting tests in July at Mitsubishi Heavy Industries (Futami plant) the inboard segments "AU" and "AP" were shipped to Korea. ...before the two main segments—"BU" and "AU"—were positioned and measured. The segments matched within gap tolerances of 0.25 mm to 0.75 mm (considering 0.05 mm of off-set during the test), an accuracy of more than one order of magnitude in relation to conventional high-precision welded structures of comparable size. The complete set of 18 toroidal field coils (with interlocking cases) is shown here encircling the ITER vacuum vessel. A toroidal field coil case is formed from four principal segments as shown in the lower left of the image: the inboard segment AU (66 tonnes, 16 metres) with its corresponding cover plate AP (8 tonnes, 12 metres), and the outboard segment BU (103 tonnes, 14 metres) with its corresponding cover plate BP (12 tonnes, 12 metres).